“Irene and I did a recce today of the Stanford Wandelpad and glad that we did. We found that one part of the footpath is underwater due to the high water of the river which will be that way until or unless the Grotto Beach access to the sea is breached. Hence we had to divert to other roads and join the path further along. We also met an extremely nice chap…who is also a keen member of the Stanford Bird club… Royd Frith… and he pointed out an excellent side track with superb views of the river. He also knows Peter Hochfelden and suggested we ask him to be our guide on the 4th May. On our return home I phoned Peter Hochfelden and he has willingly agreed to be our tour guide for the visit. I have discussed this with Mike Brian and he is very happy with this idea. Hence…for the blog… we still meet and Fernkloof at 0800 and once we have consolidated cars we drive to Stanford to meet Peter at the Information Shop along Queen Victoria road. For any members who wish to meet us there I suggest that they park along Longmarket (3rd turning on the left after turning off the R43 ) next to the Village Green where there is plenty of space for parking. The walk is about 2 kilometres, so please bring liquid refreshment to keep you cool en route. At the Special General Meeting held on the 19th April 2017, with over 50 members in attendance, it was unanimously agreed that Hermanus Bird Club should become an affiliate member of BLSA. The details of the Affiliation agreement and the revised BLSA Constitution were circulated to all members on March 11th 2017, as was the wording for the change to the Hermanus Bird Club’s required addition to the constitution. This wording –“The HBC supports the aims and objectives of BLSA and agrees to abide by the revised BLSA Constitution adopted on 21 March 2015” will be included in the updated HBC Constitution, which will be sent to all members. 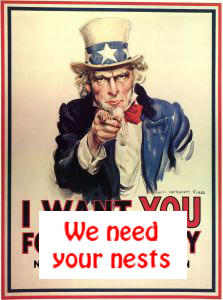 Please keep your nests in a ventilated box in your garage until further notice as storage facilities are not available!! Renee and I spent a few hours at Strandfontein yesterday morning, hoping to see a Sand Martin. We did not, but we saw plenty of other birds, none of which added anything to my challenge list! Then, when we arrived home in Hermanus, I opened my mail to see a notice from Trevor Hardaker advising of a Western Yellow Wagtail at Strandfontein. Then a Squacco Heron and, this morning, a Lesser Crested Tern!! Talk about bad luck – the Tern would have been a lifer for me. Pity Strandfontein is so far away. As you are probably aware, our club is mounting a stand at the annual Fernkloof Flower Festival, which is held in September. Our theme this year will be nesting, so if you have any disused birds’ nests lying around please let either Craig Holmes or Pat Redford have (or borrow) them. Keep you eyes open for failed or disused nests in the wild too, but please do not disturb or damage any active nests. We need around 100 nests to build the envisaged stand, but have only received 6 to date. The results of the Challenge at the end of March were pretty much unchanged. Mike still led the way with 205 birds worth 468 points, followed by Ronnie on 201 birds worth 456 points. In third place is Sheelagh on 183 birds worth 391. Sadly for Mike, he has temporarily dropped out, as he is in Turkey, but when he returns he will no doubt make a run for the line! It is getting hard to add birds now that all the easy ones have been seen, so let’s see how we go from here. “We’ve decided first to re-establish a colony which started naturally in 2003 but was prevented from taking hold due to predation by terrestrial predators”, says Wanless. “By setting up an effective predator-proof fence we plan to avoid that happening again.” Decoys and the playing of penguin calls will be used to attract birds in from sea and just-fledged chicks will be moved to the new areas to encourage them to return there to breed. “While this process could occur naturally over several hundreds of years, we need to help it happen faster”, says Wanless. African Penguins also face a number of other threats, from predation to oil spills to the lack of nesting habitat, and there are conservation interventions in place to address these. Artificial nest boxes are provided to improve breeding success and rehabilitation centres have been set up to care for oiled and injured birds. Johannesburg, 6 April 2017: African’s vultures are in trouble. Most old-world vultures (vultures found in Africa, Europe, and Asia) have faced severe population declines and are on the edge of extinction. The Cape Vulture is found only in southern Africa, which means that South Africa has a special responsibility to protect this species. This vulture was recently up-listed from “Vulnerable” to “Endangered”, and the species faces numerous threats including poisoning and collisions with and electrocution on powerlines. Scientists predict that increased temperatures associated with global climate change may also negatively impact Cape Vultures. Ironically, a major part of our strategy to minimize climate change – wind energy – may pose a new threat to these endangered birds. “It is with great sadness that we share news of the first Cape Vultures fatalities as a result of collisions with wind turbines” said Samantha Ralston-Paton, Birds and Renewable Energy Project Manager at BirdLife South Africa. “As far as we know, these are the first incidents of this kind for the species” she said. To date four Cape Vulture fatalities as a result of turbine collisions have been reported to BirdLife South Africa. The collisions were expected and have confirmed conservationists’ concerns that Cape Vultures and wind farms are not compatible. Other vulture species (e.g. the Eurasian Griffon Vulture) have experienced high fatality rates at wind farms in Spain, and the Cape Vulture is ranked as the top priority in BirdLife South Africa’s list of bird species likely to be vulnerable to the impacts of wind energy. “It is a challenge to find a balance between wind energy and bird conservation,” notes Samantha. “Climate change is a significant threat to our environment and to our well-being, and healthy ecosystems are our main line of defense. We need renewable energy, but it must be developed with respect for nature,” she said. The most widely accepted strategy to minimize wind energy’s negative effects is to place wind turbines outside of areas regularly used by collision-prone birds. Vultures travel many kilometers from their colonies and roosts, and according to BirdLife South Africa, this implies that large areas may be unsuitable for the development of wind farms. One of the wind farms that reported Cape Vulture fatalities is located approximated 20 km from the nearest known vulture roost, and the other is approximately 12 km from a temporary roost. “We have come a long way since the first wind farms received environmental approval. The impact assessments for the two wind farms where the mortalities were recorded were completed before BirdLife South Africa and the Endangered Wildlife Trust’s Best Practice Guidelines for monitoring and impact assessment were adopted, and we also now recommend, and are seeing, much more rigorous impact assessments where wind farms are proposed within the range of Cape Vulture” notes Samantha. “We are grateful that post-construction monitoring data are being gathered and shared with us. This is not the norm in many countries elsewhere in the world. So far only a small number of vultures have been affected, but it is important that we learn from and respond to these experiences as quickly as possible to make sure the number of mortalities stays low. Sharing this information also gives us an opportunity to engage with decision-makers, wind farms, bird specialists and researchers to try find solutions”. Both wind farms have committed to implement further mitigation measures, including actively searching for and removing any animal carcasses in the area. This will reduce the likelihood of vultures visiting the wind farms in search of food. The risk of collisions can also be minimized by stopping turbines turning when vultures are observed in the vicinity of the wind farm. This strategy has been implemented at one of the wind farms, and is being considered at the other. BirdLife South Africa, the Endangered Wildlife Trust and VulPro have recently issued a statement highlighting their concern around ambitions to develop wind farms in the Eastern Cape. Two Renewable Energy Development Zones proposed by the Department of Environmental Affairs’ draft Strategic Environmental Assessment for Wind and Solar Energy overlap with areas regularly used by Cape Vultures. “A recent study by the CSIR has confirmed that the wind resource in South Africa is excellent in most areas, and we believe there is no need to develop in high risk areas” notes Samantha. Now that there is evidence the Cape Vultures are at risk at wind farms, the challenge for conservationists and environmentalists is to make sure that the number of vultures affected remains low. “One of BirdLife South Africa’s roles is to make sure that birds do not get overlooked as we scramble to find solutions to the climate change crisis” Samantha concluded.